There is something basic and honest and good about tea. But, there is something absolutely magical about tea-time. Of course, you must hand each lady a fan as they enter your tea room and offer each gentleman a cigar. If you don't want to make the tea yourself you can visit Tara: A Country Inn in Pennsylvania and they will gladly serve you at 4:00 p.m. 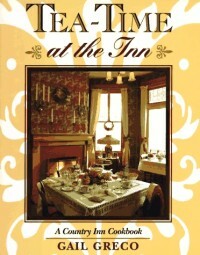 It would be great fun to spend a little time, tea-time, at each of the Inns in this book. The photos of the Inns and the recipes are terribly enticing. About the only thing missing is the tea recipes themselves. There are only a few mentioned. I guess any good stiff tea made in water just to the boil and served in a china cup will do. It certainly is a start.